Having left Conguillío, we found a campsite just outside of Pucon right on the shores of the lake. It had really good facilities - a picnic table under cover, with electricity, hot showers and the use of a BBQ - if a little pricey for camping at 10,000 Chilean pesos per night (approximately £10). We were the only campers there. Fed up with rain over the last few days, we were ecstatic to awaken to bright, clear blue skies. And unlike the day before had fantastic views of the active Villarrica Volcano itself across the lake from where we were pitched. We could really appreciate then the great setting we had. 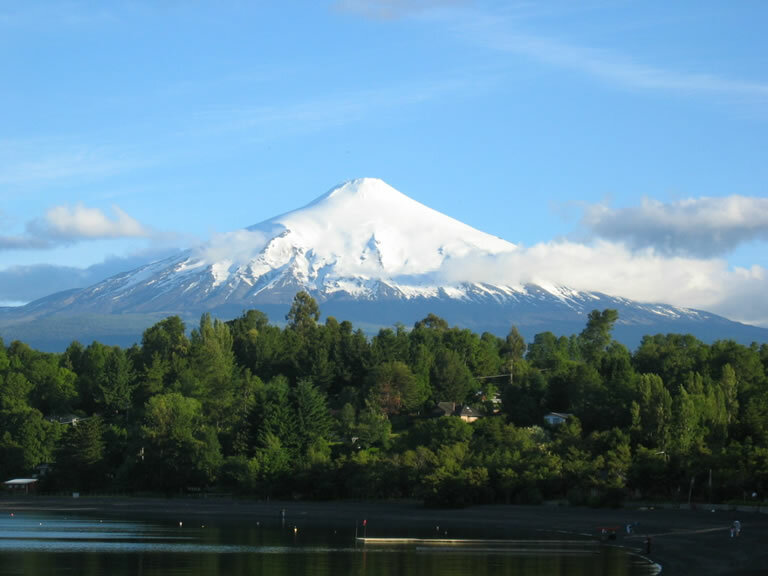 We decided to stay at Lago Villarrica for another day and make the most of the good weather to do a few bits and pieces on the Weasel, get some laundry done and relax a bit. We had noticed that there was a lot of condensation suddenly appearing in the back of the landy and couldn't work out where it was coming from. As we started to haul everything out we soon realised that water had been getting in somehow. It didn't take Ed long to work out where the leak was coming from - where the side panels of the landy join the tub, you could see daylight. We guessed all the rattling around the landy had had to suffer over the last few months had taken its toll. We dried the inside and taped up the outside to stop any more water coming in. Hopefully that would see us through until we got home to make a tidy repair - provided the Patagonia weather did not live up to its reputation of being very wet and windy! All dried out and repacked, we spent a relaxing evening with a BBQ - Ed's turn to do the cooking - and lots of red wine.